Confused about whether to get clear aligners (a.k.a. invisalign) or go for traditional metal braces? Both are good options, but we are here to help you choose which one will work better for you. To make it comprehensive, let us compare in terms of structure, efficiency, aesthetic, and cost. Traditional braces are made of metal. High-grade stainless steel brackets are attached to the teeth and a metal wire links these brackets altogether with elastics. These elastics can be clear or colored and you get to choose which color you want. Clear aligners, on the other hand, are made from BPA-free plastic and worn over the teeth to subtly adjust it. Think of it as a 3D model of your teeth, and the aligner trays are adjusted by your orthodontist every 2 weeks on average. Traditional metal braces are effective in correcting the misalignment of teeth as well as jaw alignment. On average it takes 2-4 years to effectively align teeth, depending on your condition and needs. The metal braces are worn all day and every day and are reliable when it comes to adjustment. Clear aligners can be removed every time you are going to eat, drink, or brush your teeth. It has to be worn 22-24 hours per day for 6-18 months, also depending on your conditions and needs. Traditional metal braces are visible and you can choose whether to use clear elastic bands or colored elastic bands to attach the metal wire to the brackets. 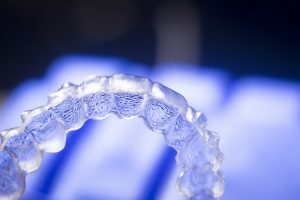 Clear aligners are made to be invisible (that’s why it’s also called invisalign). On average, traditional metal braces cost around 1,800 – 5,000 USD while clear aligners cost around 5,000 USD. Now that we have lined up the key differences for you, feel free to choose which one to get and schedule an appointment with your orthodontist as soon as you can.